The terrorist attacks in the United States on September 11, 2001 were carried out exactly eleven years to the day that George W. Bush’s father first proclaimed his vision of a New World Order to the US Congress. Like his father and other presidents before him, George W. Bush responded to this crisis using words and phrases familiar to the American public. 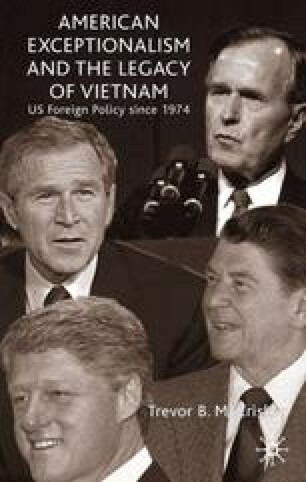 He claimed the US had been attacked because ‘we’re the brightest beacon for freedom and opportunity in the world’.1 Bush was evoking the belief in American exceptionalism that, as we have seen, has persisted throughout American history. The belief has been perceived and expressed in different ways by different people at different times, but the basic premise has remained constant: the United States is a special nation with a special destiny, not only unique but superior among nations. This belief has survived and flourished despite the ample evidence available to Americans that suggests their nation is no more exceptional than any other nation.